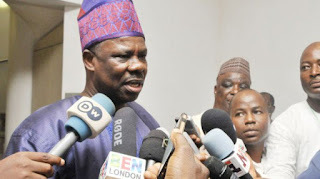 No fewer than 26 loyalists of Ogun State governor, Ibikunle Amosun, on Monday, announced their defection from the All Progressives Congress to the Allied People’s Movement. The defectors were the aggrieved members of the APC who claimed to have won the legislative primaries of the APC conducted by the state election committee, appointed by the National Working Committee held October 8, 2018, in the state. Addressing journalists on behalf of other members, the spokesperson of the group, Lamidi Olatunji said, they were declared winners by the committee Chairman, Col. Ali Ciroma, (retd), but, were refused the Independent National Electoral Commission ’s forms for the nomination of the party as candidates for the election till it closed December 2. Olatunji in his speech titled, ‘Why we are leaving APC for APM’, said “after extensive and due consultations with our elders, members and stakeholders in the APC in Ogun State, we have come to the inevitable conclusion to seek the general mandate of our people in the 2019 elections on the platform of the Allied People’s Movement. He, however, said,” We regret that Mr. President’s efforts were frustrated by the forces that are hell- bent in taking the South West back to the dark age of slavery where unelected kingpins direct the affairs of the people. “We are committed to the second term of President Muhammadu Buhari and we are determined to deliver Ogun State to him in the Presidential election, come February 16, 2019, by the grace of God. Speaking on the roles of governor Amosun on their defection, the group’s spokesperson exonerated the governor, saying, they were old enough to take decisions without the input of their boss. He said, “Governor Amosun is still in APC while we have moved to APM. Governor Amosun has nothing to do with our decision to defect to APM”.